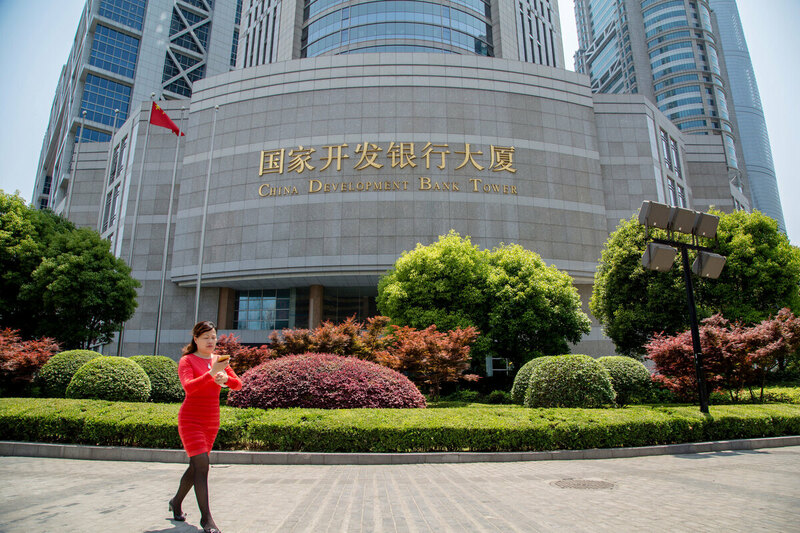 Opinion: China's Role As The World's Development Bank Cannot Be Ignored China's development banks provide as much financing to developing countries as the World Bank does, Boston University's Kevin Gallagher explains. A woman walks in front of the China Development Bank tower in the Pudong district of Shanghai in 2015. That and the Export-Import Bank of China have provided nearly $1 trillion in financing to foreign governments since the early 2000s. Kevin P. Gallagher (@KevinPGallagher) is the director of the Global Development Policy Center at Boston University's Pardee School for Global Studies. China has become the world's largest development bank. According to new research at Boston University's Global Development Policy Center, the China Development Bank and the Export-Import Bank of China now provide as much financing to developing countries as the World Bank does. Those are just the figures for China's two national level development banks and does not include Chinese bilateral and multilateral development finance arrangements. China has negotiated close to $170 billion in bilateral and regional development funds across the world — such as the China-Africa Development Fund, which just received a Chinese pledge of another $60 billion. China also helped create the New Development Bank with Brazil, India, Russia and South Africa, and the Asian Infrastructure Investment Bank with nearly 80 countries in Asia and beyond. China's far-reaching financing carries considerable risks — for China and the borrowers alike. Rather than welcoming China and helping it learn the hard lessons learned by others, the United States is mistakenly shunning Chinese development finance around the globe. Given the world economy's need for development finance, China's arrival on the scene couldn't be more welcome. According to the McKinsey Global Institute and the World Bank, unmet global infrastructure needs until 2030 top more than $3 trillion annually if they are to be conducted in a manner that is low carbon and socially inclusive. Naturally, emerging markets and developing countries have flocked to Chinese development finance, despite the fact that it has been slightly more expensive than what the West offers. The developing world has preferred China's loans because it has financed what these countries want — big infrastructure and energy projects with no strings attached — not what the West says they need. Western institutions and states tend to make loans conditional on a country's commitment to controversial policy reform, such as deregulating financial markets and privatizing public utilities. Reasonable questions are being raised about China's lending. Like those from Western-backed development banks in earlier years, Chinese loans now face default by countries that have long been branded "serial defaulters." China has provided massive loans to Pakistan, Sri Lanka and Venezuela, and it is not clear the Chinese will be paid back in full. Most of the countries that have received Chinese development finance won't go off a default cliff. But China's lending carries other risks. As our research at the Global Development Policy Center shows, Chinese development finance is heavily concentrated in large coal and hydroelectric power plants. No doubt these projects bring energy and electricity access to people in need. However, big coal and hydro projects are highly controversial. In Bangladesh, local communities have teamed up with global climate advocates to push back on Chinese-financed coal plants, arguing that the projects will worsen local air pollution, trigger human health problems and contribute to global warming. All across the Mekong River, big Chinese-financed hydroelectric plants have drawn down fish stocks and threatened people's livelihoods. China is right to argue that the West triggered debt problems and ignored environmental and social concerns in the past. Nevertheless, when policymakers and communities slow down or block big projects to ensure that finance brings broader development benefits, such actions affect China's bottom line. Whether it's Pakistan's debt pileup, major delays in coal plants in Bangladesh or social protest in Honduras, China's balance sheet looks increasingly risky. Chinese creditors may believe they can weather the storm because they have a longer view. Whereas Western investors are fickle and retreat once risk shows its face, China is in it for the long haul. That's a laudable approach. Still, China is courting serious reputational risks — and that may be the heaviest blow of all. Western development financiers know all too well that their tattered past is something they have to overcome on every deal. Now China is getting some new headaches for its lending. The Trump administration has criticized African and Latin American countries for receiving development financing, arguing that it will turn into a form of colonialism. Democrats have joined in as well. In early September, more than a dozen U.S. senators wrote a letter to the Trump administration urging the president to use his leverage at the International Monetary Fund to get tough on China's "predatory infrastructure financing." As hypocritical as that is — almost every emerging-market crisis has been a function of predatory speculative financial flows from the West — China's overseas loans may be the newest point of contention for the U.S.-China relationship. While China should be lauded for financing infrastructure without attaching the Western-style conditions that have brought more harm than good, Chinese lenders need to be cautious. China has a chance to capitalize on its clean slate and show it can succeed where the West did not. But that opportunity only comes once and shouldn't be squandered.